The chap and I both picked a restaurant each to book an evening meal for our minibreak to Copenhagen. 108 appealed to D because it wasn’t just another tasting menu as is often the case in higher end restaurants, which meant he could avoid the fish dishes if he so desired. 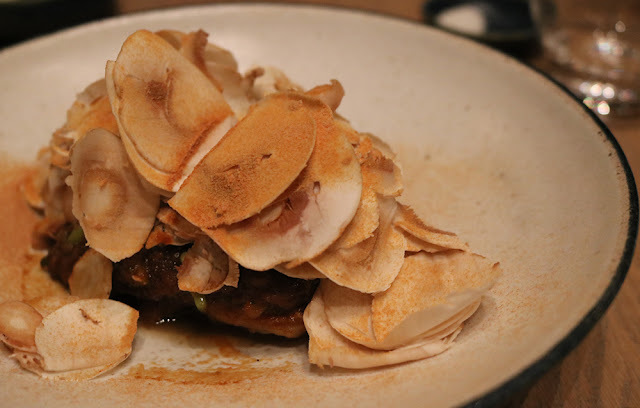 108 is located near to what was once Noma, dubbed the greatest restaurant in the world for a number of years (it’s now closed but set to reopen in a couple of years in a new location), it’s also Noma’s informal (and cheaper) sibling. The dining room is relaxed, with stylish stripped back interiors but with attention to small details, such as the cutlery wallet, reminding you that you’re in somewhere a little more special than the local caff. 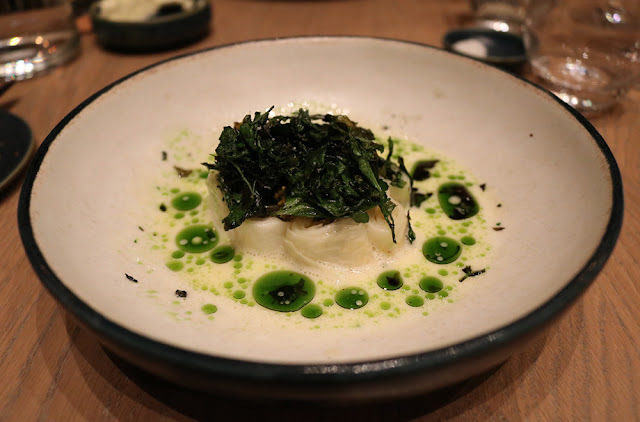 108 is well and truly part of the New Nordic Cuisine movement focusing on fresh, local and natural produce. 108 is slightly different from others in the movement in that they ferment the produce they harvest, extending its lifespan slightly. 108 is the brain child of chef and co-owner, Kristian Baumann (who is only 29! ), who used to work at Noma. 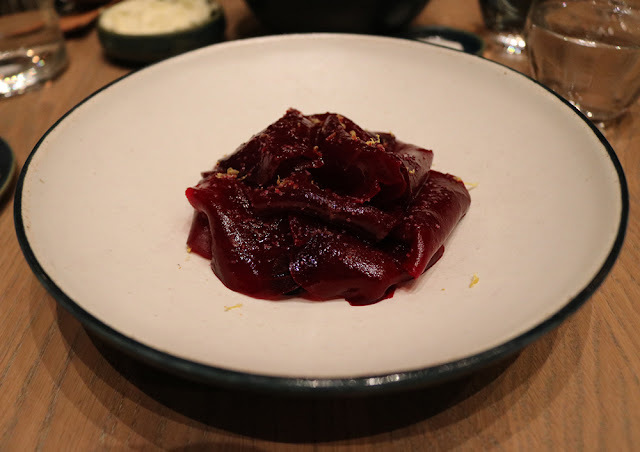 He has turned the former whale meat warehouse in to a cool Nordic dining room with a small corner of the restaurant housing a walk-in space for coffee and wine which opens daily from midday. 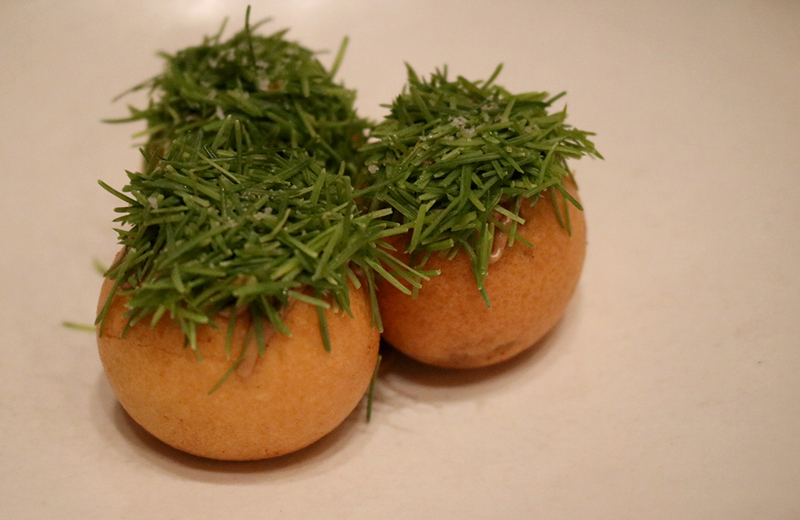 Chef Rene Redzepi is the other half of the ownership of 108 and also co-owns Noma. His ambition is that eventually no one will remember that 108 is linked to Noma. When we visited 108 hadn’t yet been awarded a Michelin Star, that followed in the next coming weeks, but it wasn’t a surprise as the standard was very high and one of the best meals we had in Copenhagen. 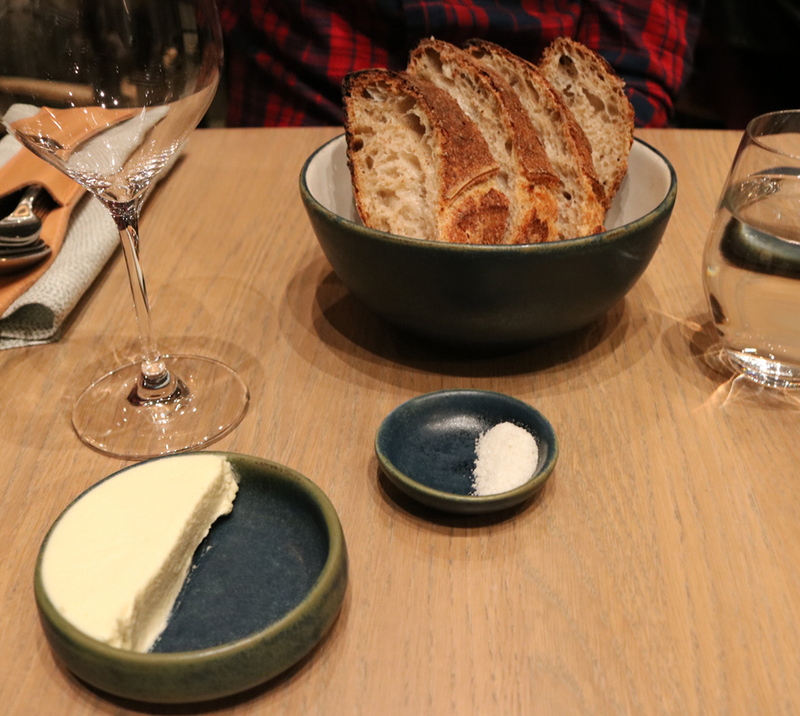 We visited Noma on a cold winter’s day in January. It’s hard to dress up when it’s that cold and you have to don your big winter coat, which looks more like it should be used in Icelandic expeditions rather than for the walk to a fine dining restaurant. However, I’ve found things are little more relaxed in Nordic countries, especially in the winter, where people dress a little more casually and you aren’t frowned upon for doing the same. Freezing, but a pretty walk down to 108. As soon as we walked in we receive a warm welcome, both in person and in temperature, we were relieved of our coats and led to a shared dining space in the centre of the restaurant. We visited mid-week, the restaurant wasn’t full but it wasn’t empty either. 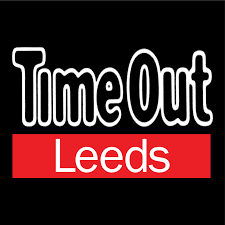 We found it relatively easy to make a booking and relatively easy to change it when another restaurant could only cater for the original date we had booked 108. Perhaps, however, this has changed since it got its Michelin star? Be sure to book in advance just in case. 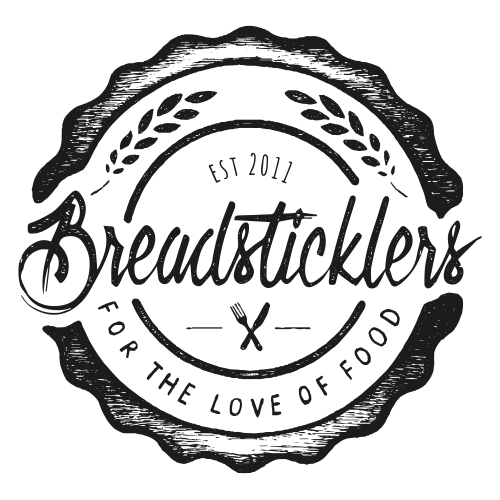 As stated previously the menu is a la carte, the owners state that their reasons for doing this is because they want you to lead your own night in your own direction. We ordered everything on the menu that wasn’t fish, of which there was plenty of choice and we had 5 dishes (out of 7 to choose from) to share between us. Braised Ox Tail with pine (needles). The funniest looking dish, but when discussing our favourite dish of the night this won it for me. The pine needles, granted, were a little odd and a fair few became lodged between my teeth but the ox tail within was cooked to perfection. Winter Beetroot with hot smoked veal heart and blackcurrants. Another wonderful dish. D with his mouth still chewing away advised that he thought the beetroot was really nice and asked what the ham was that came with it. To which I advised that it wasn’t ham it was smoked veal heart. Cue a shocked look on D’s face. This trip was to be D’s food awakening, pushing him into unchartered and unexplored areas he would have never have thought to have tried prior to meeting me. Although, in fairness he didn’t have much choice as I chose the menu options, but if you don’t tell him what it is he likes it! Salt Baked Celeriac with aged cheese and grilled parsley. This dish almost pipped the ox cheek to the post but ended up coming in second best for me. The broth was delicious, so much so that I was desperate to pick up the bowl and slurp it down like a good cup of tea. Grilled Chicken with raw mushrooms and dried scallops. “Oh, I didn’t like that bit”. Sigh. I guess I still have to continue to chop up the mushrooms small to disguise them in my cooking at home. 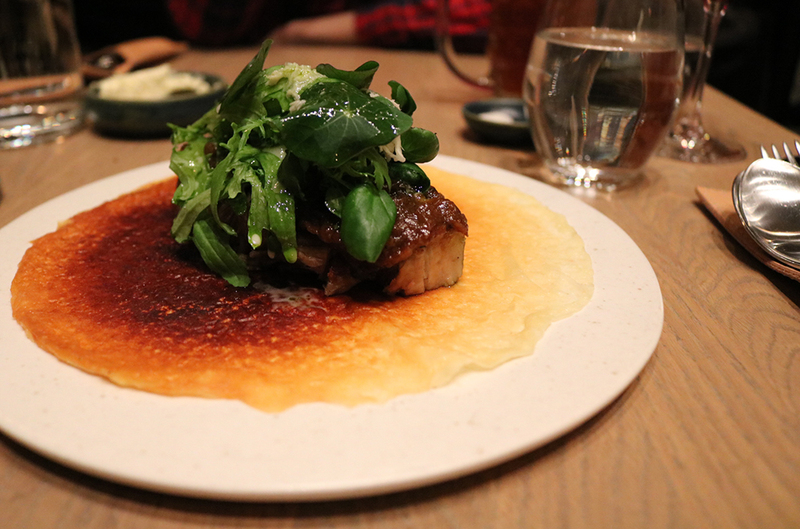 A caramelized milk skin with grilled pork belly and cress. Another dish that doesn’t sound particularly appetising, who wants to eat milk skin? Turns out its fabulously delicious. It appears to look like a flat pancake but it’s incredibly delicate but strong enough to wrap around the pork like a taco. The pork belly was some of the best pork belly I’ve ever had the privilege of eating, I even liked the fatty bits. There were three desserts to choose from and when it came to asking us if we wanted dessert we replied yes we’ll have all three! We enjoyed the mains so much it would be a shame not to see what they could do with sweets, the waitress laughed and exclaimed “and why not!?”. The menu recommends four dishes per person so this was only taking us one more over the recommendation, we were on holiday, if you can’t indulge on holiday then when can you? A sourdough cone filled with wild blueberry sorbet. 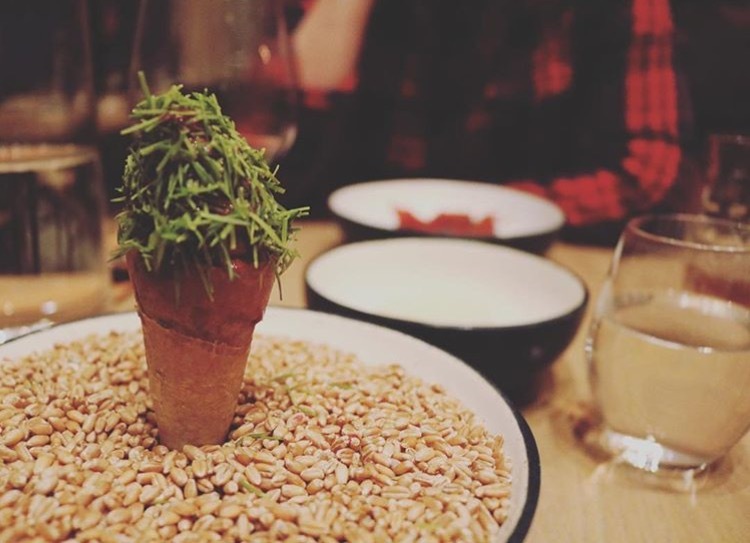 The first dish to be brought out to us contained yet more pine needles, the sorbet was wonderful, strong in flavour and refreshing at the same time. The chef brought this plate to us and we were honest that we liked the pine needles with the ox cheek but weren’t so found of them with the sorbet, he didn’t look downtrodden but took it humorously and explained that he had decorated it in this way to make it look like a Christmas tree, cute, but I’ll take a miss on the needles next time. 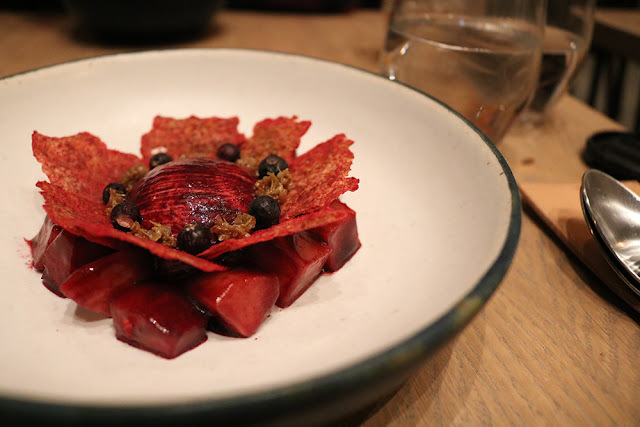 Rausu Kombu ice cream with toasted barley and an oil of blackcurrant wood. 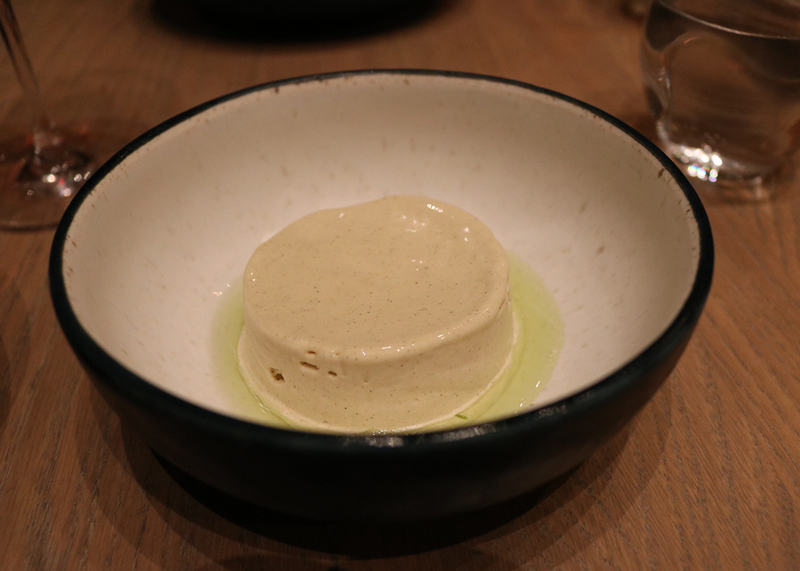 This dish looks like a panacotta but it’s actually ice cream. We were advised to eat this one from the inside out and I can see why as its flavours oozed out to the edges when we dipped our spoon in. Pineapple weed parfait with baked apples and oat. A brightly coloured dish and rather spectacular looking. The creaminess of the parfait offset the tart of the apple and the flat oat crisps were just a thing of beauty. This was my favourite dessert of the three. I absolutely loved our meal at 108, the staff were brilliant too. They take the food seriously but they hold on the snobbery and make you feel relaxed and at home in their restaurant. Something I noticed echoed throughout Copenhagen, and something perhaps the restaurants in the UK should take note of, why shouldn’t you be made to feel welcome in a restaurant? I don’t need to be waited on hand on foot and put on a pedestal (albeit sometimes that is nice), just treat me like a human being. 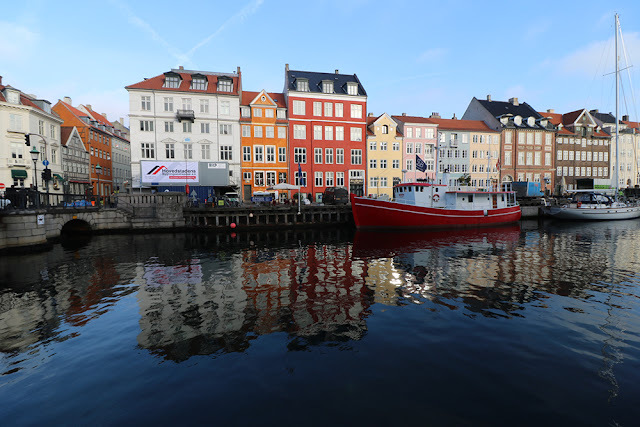 A lot of the places we visited in Copenhagen were one time wonders, what I mean is that they were nice (and expensive) but I possibly but wouldn’t visit again, (been there, got the t-shirt, there are plenty of other places to visit in this 13 starred Michelin city) but I can’t say the same for 108. If I go to Copenhagen again I would definitely make a booking to visit again, even if just for a coffee. The total cost of our meal at 108 was 1,230 Danish Krone (£143.74 rate at the time of purchase).